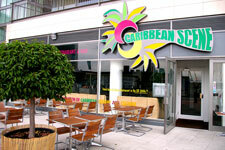 When Jamaican-born Patrick March set out to establish an authentic Caribbean restaurant in London's east end, his sights were initially set on the high footfall cultural area of Stratford — rather than in the shadow of the ExCeL Exhibition & Conference Centre in the fast developing Docklands. But when council red tape delayed the proposed Stratford project — which will now open towards the end of this year — Patrick and his investors instead launched the Caribbean Scene concept at the Western Gateway overlooking ExCel Marina. 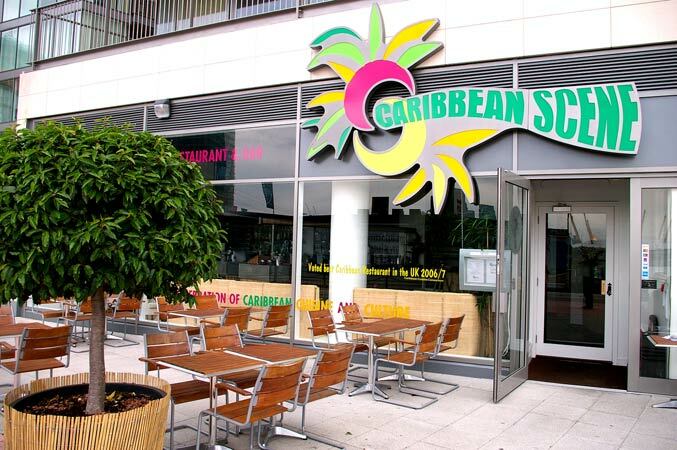 Designed for total relaxation, the new 3,400 sq ft capacity restaurant caters for the fact that despite the large Caribbean population that settled in London over half a century ago, Caribbean cuisine still hadn't arrived in the dining mainstream. While the summer months will offer pavement society at ExCeL the opportunity to dine al fresco, inside the building the owners have tasked The Sound Division Group with creating a vibrant and versatile cross-cultural mix in which audio and video signals can be patched randomly through the building's four zones (including toilets), to change the mood, atmosphere and operating base at will. 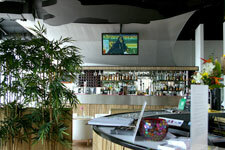 Under the project management of Jon Carey (JLC Contracts) and the company's installation manager Elliot Patterson, SDG have supplied an integrated sound, lighting and video package which is evident as soon as you enter the venue's Hurricane cocktail bar from the waterfront pavement. Using the premium space available SDG have provided a pair of Turbosound TQ308 speakers on stands — taking feeds from a Soundcraft FX8 8-channel mixing desk and industry standard outboard processing — and a simple PAR 56 300W dimmable stage lantern bar to provide stage area PA and production lighting for the weekend steel and reggae bands who will play in the bar area. Both the bar and facing restaurant/VIP area offer high visual impact created from a pair of 42in and 50in Panasonic plasma screens, while a Mitsubishi XD490 3000 lumen DLP projector fires onto an 8ft projection screen in 4:3 aspect ratio. Processing a selection of sound feeds is a BSS Soundweb Lite 3088 programmable digital audio system; these are routed to a combination of JBL Control 29AV and Control 28 full range speakers, powered by Crown XLS and Xs camplifiers. SDG knew that the venue would depend heavily on its private party bookings from the ExCeL and designed an elaborate cabling infrastructure, offering a high degree of Kramer high-speed data and compositie source switching flexibility and tasking ace BSS Soundweb programmer Martin Barbour with designing gain structures on the loudspeaker management system that would see it not only function as a matrix router but also incorporate sufficient limiting to avoid disturbing the neighbours. Patrick Marché (who runs the business with his wife/co-founder Valerie and an active team of directors) had invited Sound Division to tender after they were recommended by one of his employees — but they still had to win the contract against fierce competition. The brief handed down to David Graham's company was twofold. In Patrick's words: "We wanted the three main areas to be independently controlled; this was very important for us and it has proved really effective to be able to zone our DVD, TV and MP3 sound sources to create variety." And by providing four BSS 'Shrimp' local remote control panels staff are able to change source select and volume levels at will. Soundweb also met the second criteria, as Patrick explains. "In an upmarket area — with a major block of apartments being constructed opposite — we needed to consider noise pollution. Sound Division have provided us with a system that can be carefully focused and easily controlled — in fact we will only add bass when DJ's are brought in for private parties." And so Patrick and Valerie Marché (who doubles as restaurant manager and interior designer), have been able to dictate the ergonomics of the theatre kitchen, walk-in freezers, back-of-house area and sound and lighting in their brand new building — giving them 100 restaurant covers, 90 further seats outside and 40 at the bar. Sound Division Group are not the only high-pedigree company associated with this project. The architect is Audrey Keong of AKLC, who includes The Water Margin restaurants (the latest being at the 02 Arena) and Aroma Restaurants in her portfolio. The main contractor was Peach Projects, who masterminded the fit-out, while EMH International were responsible for the open theatre kitchen and servery areas. Operational staff at the venue (which has already picked up its first award) includes celebrated chef, Anthony Cumberbatch (formerly of the Ivy), while Patrick Marché also credits celebrity chef Patrick Williams for his support in the realisation of this project. In summary he says, "We are representing all the islands of the Caribbean — with both the food and the music. "Thanks to the flexibility Sound Division have given us, we will be able to provide a mix that includes reggae, soca, ska, calypso, steel bands — we will also try and bring in some dancers as well." SDG's David Graham responded, "Patrick has been a great client and a pleasure to work for. The sound produced from the JBL speakers is warm, rich and bassy — creating an environment where people can relax and soak up the amazing atmosphere of this place." Once the Marchés have opened their larger (5,200 sq ft) Caribbean Scene in Stratford, they plan to consolidate before rolling out a series of branded restaurants across the East End.